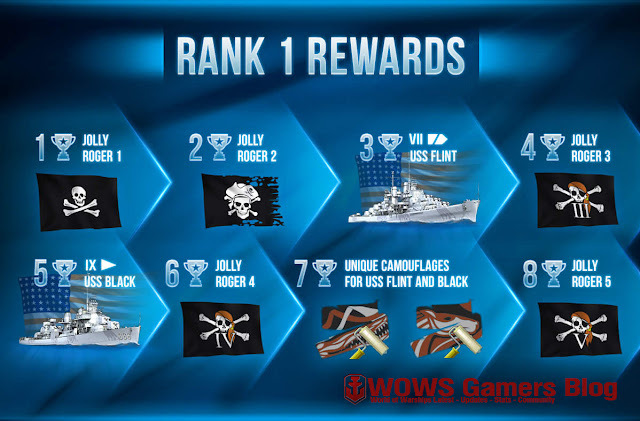 Home » advice , battles , ranked , stats , world of warships » World of Warships - Ranked Battles - How Long Will it Take To Reach Rank 1? World of Warships - Ranked Battles - How Long Will it Take To Reach Rank 1? 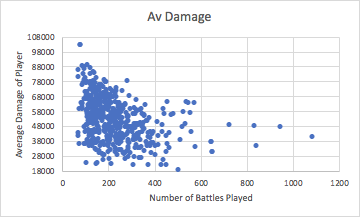 Forunite "senseNOTmade" ran some of the data on Ranked Battles available on WoWs-numbers through an excel spreadsheet to see what I could find. If anybody knows other sites where data on the 8th Season of Ranked Battles can be found, please tell me. It took an average of 232 battles to reach Rank 1. The graph shows the number of battles played in ranked by players who had reached rank 1 by January 25th. 491 players had reached rank 1 when I collected my data. The distribution follows a negative binomial, which is to be expected as such a distribution describes the number of occurrences before a certain number of failures is reached (so, how many battles occur before enough stars are reached). The mean number of battles amongst them was 232.9, but with a very high spread. The highest number of battles played was 1087 (32 battles per day for a month), while the lowest was a mear 70. So how can we avoid having to spend 8 hours per day playing in order to reach rank 1? Each Lost Star adds an average of 2.15 to the Number of Battles needed for Rank 1. The graph shows the win rates of players who reached rank 1 relative to the number of battles they played in ranked. Unsurprisingly, win rate is by far the best predictor of how many battles people have played in ranked. The correlation is curved as we would expect, as having a lower win rate means that you both gain fewer stars and lose more. The correlation is also negative, implying that players did not hang around and play lots more battles after achieving rank 1. 69 total stars needed for rank 1. It is assumed that all players started the season with 23 stars due to having achieved rank 1 in the previous season, hence they need 46 stars. Note that I got a small number of negative results from my calculations, meaning that this assumption held for most but not all players. Graph shows win rate and the calculated number of "bad losses" (losses in which a star was lost) relative to the number of battles. So each star you lose increases the number of battles you need to reach rank 1 by an average of 2.15. Being Top of the Team is important but not necessary for achieving Rank 1 quickly. Graph shows win rate and the proportion of good losses relative to the number of battles played. Good losses are losses in which the star is retained, either due to a rank being irrevocable or the player being top of their team. The rate of good losses is the number of good losses divided by the total number of losses that player experience. Again, unsurprisingly, players with high win rates and the low number of battles played had the highest rate of good losses. The best player had 65% of his losses be good losses, while the worst had just 2% of his losses be good losses. The mean RoGLs was 24%. However, there is significant variance, with a standard deviation of 10%. Some players with fewer than 150 battles played had a worse RoGLs than those who had to play 1000 matches to achieve rank 1. More interestingly, the worst performers in terms of win rate were not the worst performers in terms of RoGLs. Instead, as seen in the graph, a group of players with win rates ranging from 55% to 60%, and the number of battles played between 100 and 250 did worst. This might be because a lower number of losses allowed a few anomalies to skew the results of these players, or the ship type they were playing was more team-dependent, meaning that if the team did poorly, they did poorly as well. Anyone have any alternative explanations? Average Frags was more important than Average Damage to getting Rank 1 quickly (mostly). Data were taken from all players who had reached rank 1 by January 25th. These graphs compare the average damage players caused and their average frags with the number of battles they played to reach rank 1. As can be seen, both have very high spreads, but the average frags better predict the number of battles played. This would suggest that perhaps taking enemy guns out of action is more important than getting high damage. Note that the correlation in both graphs is negative. This suggests that good players did not continue playing ranked after achieving rank 1. Instead, most people seem to have made it to rank 1 and then stopped playing. Further, note that neither of these is linear correlations. This suggests that, when you're really struggling, small increases in your average damage/frags have a big impact on how many battles you must play, but the opposite is true if you're a good player. Average Damage has a normal distribution with a mean of 52227, and with the highest average damage being 102376, and the lowest average damage is 18567. 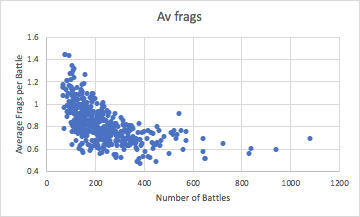 Average Frags has a logarithmic distribution, with a mean of 0.82, with the highest average frags being 1.44 and the lowest being 0.46. Graphs show the number of players who achieved this level of average damage/frags. Higher Damage increases the Win Rate of Cruisers, but not for other Ship Types. 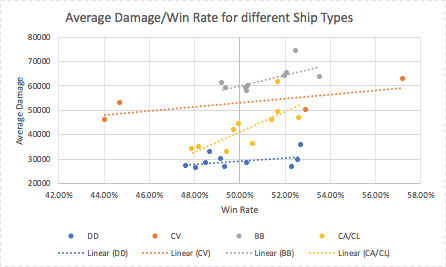 Graph shows win rate compared with the average damage of different ship classes. Ship classes of the same type (BB, CA/CL, DD and CV) are distinguished by colour. Note that this graph includes data from all players, not just those who achieved rank 1. 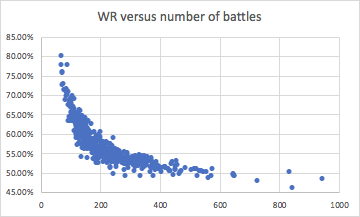 Also note that the biases caused in win rate of ships being matched against themselves a lot (which in random battles only occurs for CVs), is present to some extent for all ships in this analysis due to the increased restrictions in the MM. As expected, BBs do the most damage, followed by CVs, then CA/CLs, with DDs at the bottom. The average damage for DDs and CVs increases only slightly despite large changes in win rate. This implies that, for these classes, damage output is not the important feature which gives these ships an edge over their counterparts. BBs also have surprisingly little variation in damage output, despite this usually being the class which is thought of as the big damage dealer. CA/CLs are the class for which differences in damage output best explain the differences in win rate. This implies that the main advantage that some CA/CL classes have over others is in their damage output, as opposed to differences in utility or defence. In ranked, there is always an equal number of each ship type on each team. As such, by definition, each ship type (BB, CA/CL, DD or CV) has a win rate of 50%. However, if you look at the graph, it appears as if (for example) most BB have a win rate >50%. 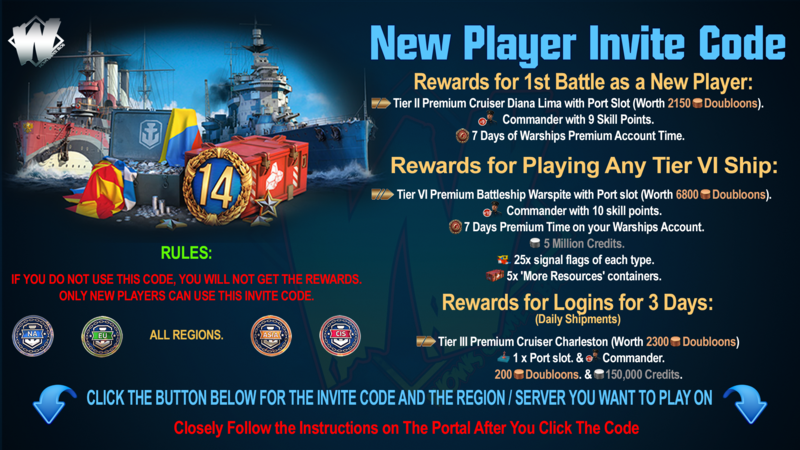 This can only be explained by the lower win rate BBs being more popular than the high win rate BBs. By contrast, most DDs appear below the 50% axis, implying that most players are playing the four high win rate DDs. CVs and CA/CLs appear about equally spread across the 50% axis. 82.1% of Players who reached Rank 1 had Premium Accounts. 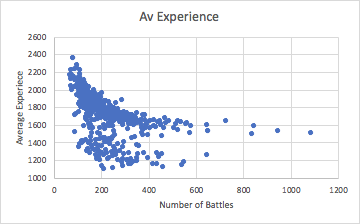 First Graph shows average experience relative to the number of battles played, while the second graph shows average experience relative to experience record, all data taken from players who achieved rank 1. In the first graph, we see that, instead of the usual curving trend between the number of battles and other factors, here there are two distinct correlations. 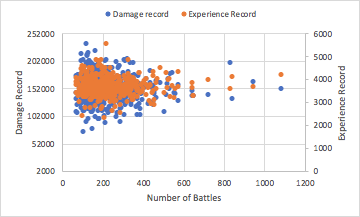 A similar pattern occurs if you compare the average experience with average frags or average damage, but not in the second graph which shows average experience compared with players' experience records. The size of the bottom trend remains consistent no matter what average experience is being compared to, at 88 data points. 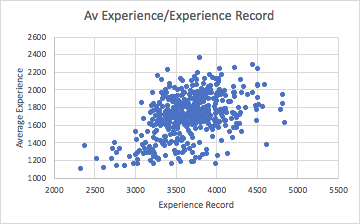 The gap between the trends in terms of average experience is consistently *1.5 the lower correlation. This therefore clearly indicates the number of players using the premium time while playing ranked. By counting the data points, we can see that (88/491)*100%=17.2% not using premium time, or 82.1% of the premium time. Personally, I found this result surprising. 2 Players used CVs to achieve Rank 1, but much more likely used a CV at least once. The first graph compares average plane kills with the number of battles played for all players who achieved rank 1. 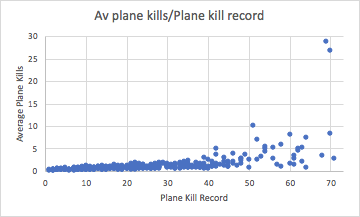 The second graph shows plane kill record relative to average plane kills for the same populations. The first graph clearly shows that 2 players had a far higher average plane kill stat than all the other rank 1 players, indicating that they used CVs. These players had some of the lowest numbers of battles played (although not the absolute lowest). What's also interesting is that none of the players with a very high number of battles played had high average plane kill stats. 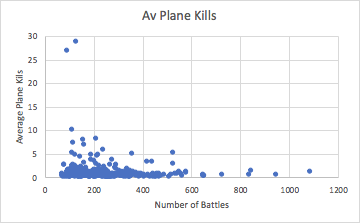 The second graph indicates that, although our 2 CV captains have a far higher average plane kill stats, several other players rival them in terms of plane kill records. 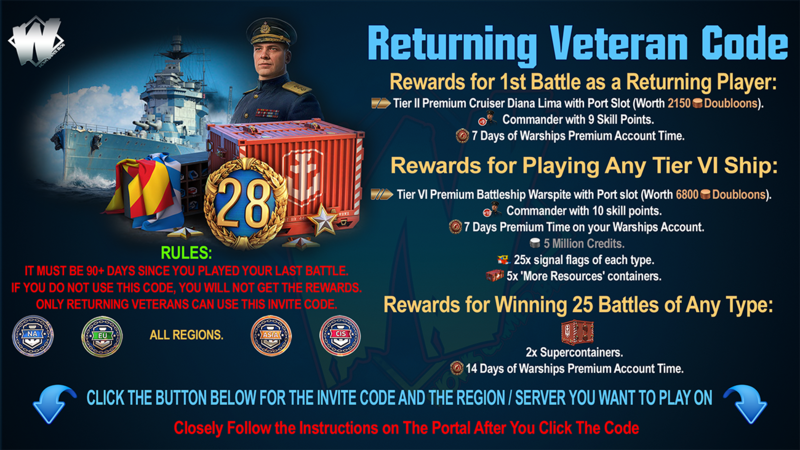 This indicates that either several players got extremely lucky while using an AA specced ship, or they brought out a CV a few times themselves and had at least a couple great games. Damage/Frag/Experience Records are totally unimportant to achieving Rank 1 quickly. Nothing much to say. Records are unimportant in ranked. Better ships are not prefered by the Player Base. The graph shows the popularity of different ship classes relative to their win rates and average damage. 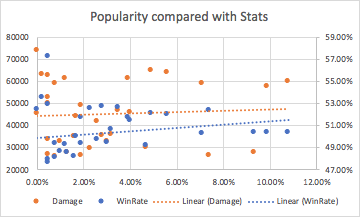 There is no correlation between either win rate or average damage and the popularity of a ship class. This might indicate that players did not pick their ships based on how good that ship performed on average. So what do you guys think? Were you surprised by anything? Have I misinterpreted something? Is there something more I should add? Your opinions are welcome.